(c) 2009 Chris Baylor licensed to About.com, Inc. The Ryobi Tek4 (RP4530) Audio Plus Nose Suppression Headphones are full-coverage over-the-ear hearing protection headphones. When the unit is turned off, the comfortable hearing protectors do an effective job of suppressing the sounds from loud power tools. When the unit is turned on, the built-in Speech Amplification Technology is designed to pick up voices and other desirable sounds to allow for normal conversations while reducing loud noises. While background sounds are amplified higher than desired, the comfort and reduction of loud noises make these a viable option to traditional hearing protection. Comfortable over-the-ear noise-suppression hearing protection with >25dB active noise reduction. Quick-response technology protects against sudden, loud noises. Input audio from external sources is barely loud enough to be heard. Picks up and amplifies background sounds (like ceiling fan noise) as much as desired sounds (voices). Operated by a 4-volt Lithium-Ion cell, with external charger included. Electronic noise suppression reduces the maximum noise level to 82 decibels. Has a built-in 1/8" audio jack that allows any headphone level audio source to be connected to the headphones. 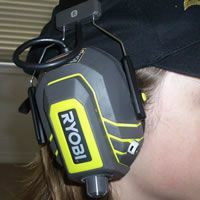 The Ryobi Tek4 Audio Plus Noise Suppression Headphones are effective at reducing the noise levels of power tools, but they're very useful for other situations where hearing protection is advisable, such as hunting, mowing the lawn or attending an auto race. The quick response technology does a good job of reducing external sounds before they can cause damage to your hearing. The fact that the unit is weather resistant means you can wear them outside without being concerned if you get caught in a sudden rainstorm. We had a drummer test these headphones; after trying them, he was very excited, because it gave him the opportunity to mix his iPod music and the live drums (that were picked up by the small microphones in the noise suppression headphones) in a way that protected his hearing but allowed him to play along with whatever music he chose on his iPod. While they certainly don't rival some of the audiophile-level noise suppression headphones available, he felt they were great for protecting his ears and giving him the ability to hear both his music and the drums.